It is an indication of just how far Nissan were ahead of the pack, that before most manufacturers have even produced one electric car the LEAF is now on generation 2. 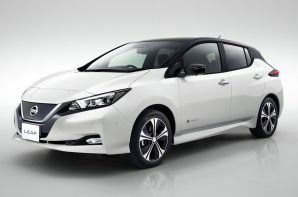 The rate of electric car development is impressive and it has allowed Nissan to deliver significant gains second time round whilst also marking a change in styling direction. The key to delivering extra performance and range is the adoption of a larger 40 kWh battery pack. The extra capacity is the result of better battery performance rather than increased volume which means that the LEAF remains the size of large family hatch. This is particularly impressive when you consider that the base car used to come with a 24 kWh battery with more expensive models packing 30 kWh. The extra energy results in a 235 mile NEDC range but at launch it is only £310 more expensive than a first generation 24 kWh model which can manage 124 miles on the same test. A more powerful 147 bhp motor also delivers a step change in performance with 0-62 mph now dispatched in a very respectable 7.9 seconds. Other tech highlights include ‘e-pedal’ which enables the accelerator pedal to also act as a brake as well. If you are thinking that isn’t too radical as all EV’s offer regenerative braking, the difference here is the LEAF will apply the mechanical brakes which allows it to come to a complete halt. The good news is that you can turn e-pedal off at which point you just get standard regeneration so we think it is useful addition as it leaves the choice to the driver. One point to note is that if you do choose to use the brake pedal it is very firm and offers little feel which is out of kilter with accelerator and steering weightings and makes the whole package feel a little underdeveloped. On more expensive models ‘propilot’ and ‘propilot park’ offer some autonomous driving and parking functions but you can’t specify them on the entry level LEAF. We can live without either of those but we think a much bigger omission is sat nav which again can’t even be specified as an option here but is standard on all other specification. Although sat nav is a useful add on for any car it is a real asset in an EV as the system will find public chargepoints along your route so we think the penny pinching is a step too far on this occasion. Nissan asked current LEAF owners what they didn’t like and it was a very short list! However styling was an issue even for people who bought the first generation car. As a result the new LEAF looks more conventional and adopts a similar style to the new Micra. We think it looks much better as a result. Unfortunately there is less to cheer inside where the general layout of the dashboard is functional but lacks real style and the buttons on the centre console look cheap. The instrument binnacle is also a curious combination of an analogue speedometer which a TFT screen beside it. It looks strange but is at least easy to read. To tempt people into a LEAF, Nissan offers 14 days use of a petrol or diesel car free of charge within the first 3 years of ownership. You can also access rapid chargepoints at any Nissan dealership for free and you get a comprehensive warranty with 3 years cover for the whole car, 5 years for EV components and 8 years on the battery including a commitment to replace the battery if the usable capacity drops below 75% (9 out of 12 bars on the fuel gauge) during this time. The second generation LEAF offers a significant improvement in range and performance whilst retaining the existing benefits of a roomy interior and a 435 litre boot. We think it looks much better outside too. It is very impressive that this has all been delivered with practically no increase in price for the base model whilst the rest of the range is cheaper than before. However it does lack a little polish in terms of the peculiar brake feel, whilst the omission of a reach adjustable steering column is disappointing and can make it hard to get comfortable, and whilst it is competent in the handling department it isn’t out and out fun. Despite the excellent official range and very competitive pricing these niggles keep the LEAF of the top spot, but it is a genuine alternative to petrol and diesel.